Student Help: How Do I Sign Up? 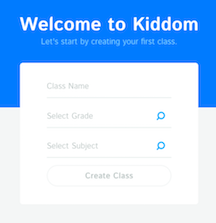 When signing up into Kiddom for the first time, click on the student link to sign up. You will need to enter a class code provided by your teacher, create a username or email, name and create password. If you forget your password, Kiddom unfortunately cannot tell you your password, but you can reset where it says "Forgot Password?" You can choose an avatar now, or change it later in settings. Then click sign up. If you have a Google account, you can sign up with your existing account. Just allow Google to access your account and login with your Google email and password. And that’s it! You will be taken to your student dashboard where you will find your classes. [Tip: If you see something that looks like below, you have signed up as a teacher.